Canada – bless its maple-leaf heart – has given Ukraine C$400 million in cash since last September to help the Kiev government finance its civil war and debts. This week in Ottawa, with the signing of a free trade agreement between the two governments, the Canadians aim to claw back the cash by obliging Kiev to allow a surge of imports of Canadian cereals, meat, timber and other products. Until now Ukrainian producers of these goods have resisted, blocking the Canadian imports for fear they will damage the Ukrainian market and domestic earnings. Canadian officials acknowledge that for Ukrainian steel, which is currently barred from entering the Canadian market at dumping prices, there will be no change, and the new agreement will make no difference. 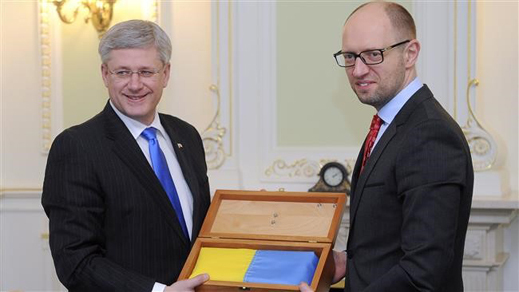 Canadian and Ukrainian officials have been negotiating the terms of the Free Trade Agreement (FTA) since 2010. Since then the the two-way trade between the two countries has risen from C$256.6 million to $357.4 million in 2013. Last year, as the country suffered regime change, war, and the loss of Kiev’s control of export industries in the east of the country, the trade figure fell to $244 million, a drop of more than one-third. The new pact was signed in Quebec by prime ministers Stephen Harper (lead image, and below left) and Arseny Yatseniuk (right) on Tuesday. Officials in Ottawa won’t say what has happened to the C$400 million in Canadian loans, issued to Kiev at an interest rate of 1.43%, in September and March. Audit and accountability requirements in Canadian law for the money have been suspended in Ukraine’s case. See the full story, here. Chrystia Freeland (right), a Ukrainian now sitting in the Canadian parliament, said: “Great 2 see my friend @Yatsenyuk_AP in Ott today. His gov’s reforms are essential 4 #Ukraine & democracy worldwide!” Freeland was an editorial writer for Boris Yeltsin when she worked for the Financial Times’s Moscow bureau between 1995 and 1998. Until this week, Canada’s export and import trade with Ukraine was too minuscule to notice – between 0.03% and 0.05% of Canada’s global total between 2006 and 2011. So analysis of its dynamics has been scanty. This publication by Alexandre Gauthier of the Parliamentary Research Service in 2012, based on 2011 figures, is the most detailed and comprehensive. Leading Canada’s exports were seafood, machinery and pharmaceuticals. The leading Ukrainian exports to Canada have been metals and coal. Until now most Ukrainian exports to Canada come from the east of the country. Copper from Donetsk and Zaporozhye leads the Ukrainian list of exports to Canada – the only destination in the world registered for Ukrainian copper exports. Steel pipes and flat and unfinished steel all come from Dniepropetrovsk; coal from the Donbass (Donetsk and Lugansk); refined manganese from Nikolaev; and machines from several eastern oblast companies. Ukrainian vodka exports to Canada do not register in the official statistics, compared to larger-value shipments of Canadian ice-wine to Ukraine. However, the new pact is likely to lift earnings for two Ukrainian-Canadians — John Vellinga (below, right), whose Multiculture [sic] Bevco Inc. ships west Ukrainian vodka and beer to Canada, and Lena Koszarny (centre), who has been investing in Vellinga’s company with US government funds passed through Horizon Capital; that’s an entity previously controlled by the Ukrainian-American Natalie Jaresko (right), now Minister of Finance in Kiev. For their story, click. For promotion of the Vellinga-Koszarny liquor, the Ukrainian Canadian Congress has called for a nationwide boycott of Russian-made vodka. During the FTA negotiations Ukrainian meat and oil-seed producers lobbied the government in Kiev not to allow dumping of Canadian products in the domestic market. The current Ukrainian beef duty is 15%; the pork penalty, 10%. For an independent study last year by the UN’s Food and Agriculture Organization of the sensitivity of the domestic industry to low-price imports, read this. According to the FAO data, until now Ukrainian government policy has been to stimulate domestic meat production, and cut imports of beef, pork, poultry – by almost 50% between 2010 and 2020. This week’s signature by Yatseniuk reverses this policy. It will produce as much as C$200 million in fresh pork export revenues for Canada over the next five years. According to Statistics Canada, the value of pork exports to Ukraine in 2014 came to just $4.4 million; zero in the first four months in 2015. According to the Ottawa handout, the dismantling of Ukrainian protection for domestic agriculture will also benefit Canadian exporters of pulses, grains, animal feed, and seed oils. Canpotex, the potash export agency, refuse this week to say what benefits they expect to see. For several years Canadian steelmills and unionized steelworkers have lobbied Ottawa to protect their livelihoods from cheap Ukrainian steel imports. In rulings issued last October and this past March, the Canadian Border Services Agency (CBSA) decided to prevent the importation of Ukrainian oil industry pipes, steel plates, and hot-rolled steel sheet. The duty levels in effect, confirmed today by Patrick Latreille, spokesman for CBSA, are 37.4%, 21.3%, and 77%, respectively. 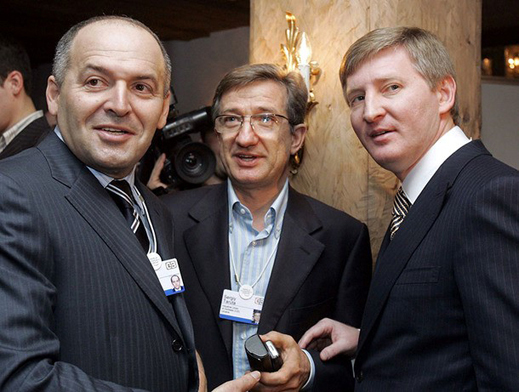 Hardest hit by the penalties are mills owned by Rinat Akhmetov, one of the oligarchs backing the eastern side in the civil war; and Interpipe of Dniepropetrovsk, which is owned by Victor Pinchuk, one of the most anti-Russian of the Ukrainian oligarchs. In the US Pinchuk has lobbied successfully for the elimination of a comparable anti-dumping penalty. For more details, read this. He has not succeeded in Canada, according to Latreille. “The FTA will make no impact [on the anti-dumping penalty duties for Ukrainian steel].” For a full list of the protective measures which Canada will continue to apply against Ukraine, together with the official reasons, click to open. 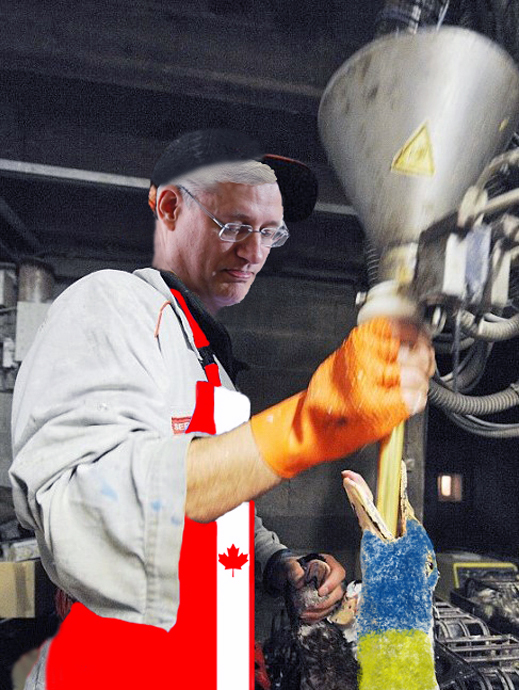 On this month’s Canadian poll projections Harper is desperate for votes to stave off election defeat for his Conservative Party. 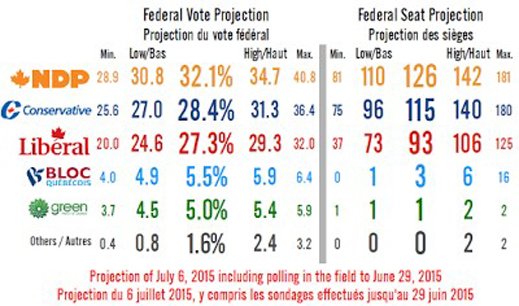 Canadian poll analysts haven’t written off Harper’s survival chances off yet. But in London, bankers who know Mark Carney, the Canadian governor of the Bank of England, say Carney is planning to capitalize on Harper’s defeat. 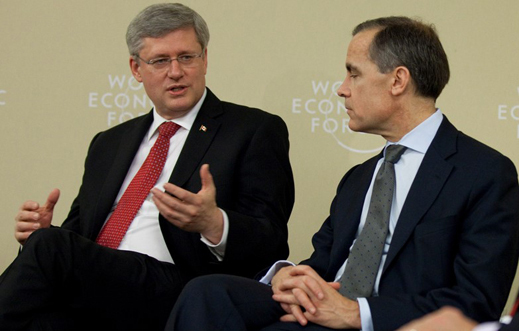 The bankers say that if Harper (left) is defeated in three months’ time Carney (right) will return to replace him as the new Conservative Party contender for the prime ministry. That will take care of the seats in several pairs of Canadian pants. Another part of Ukrainian President Petro Poroshenko’s anatomy has also been taken care of in this week’s FTA. That’s his pocket. The official Canadian list of Ukrainian exports to benefit from new duty-free entry to the Canadian market includes “sugar and chocolate confectionery”. This refers to the leading Ukrainian exporter Roshen, which is owned by Poroshenko. Since becoming president in Kiev in May of 2014, Poroshenko has been promising to sell out. However, the collapse of his business in Russia, and decline of sales in Ukraine, have lowered the value of his asset. He reportedly wants $3 billion; Nestle of Switzerland is offering one-third as much. Harper’s offer to Poroshenko to eliminate Canada’s 6% import duty on chocolate is likely to antagonize Mars and other confectionery groups in the US, whose products are being dumped in Canada, and are now threatened with retaliatory penalties. Canada’s police and customs officers are tough on chocolate smugglers from the south. However, a Royal Canadian Mounted Police veteran, who was consulted on the risks but who has asked for anonymity, said Poroshenko is in no danger of being strip-searched on the Canadian frontier like other Mars chocolate courriers – unless he is hand-carrying the several million dollars in extra cash Roshen will earn from this week’s trade pact.